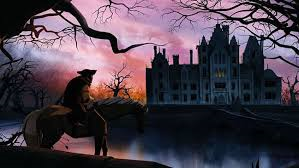 The delectable new animation anthology “Extraordinary Tales,” where five of Edgar Allan Poe’s most notable stories each receive a distinctly different visual treatment, came along at just the right time and place. I had been scoping around for a suitable seasonal post but was at a loss until I heard of the film’s release. I would have settled for a straight review. Then I realized just how fitting that this limited-release title landed at the AMC Loews Boston Common. This 3-story, ersatz movie palace may be home of the $6.50 small popcorn but at least the downtown multiplex has returned movie-going to the center of the city after so many cinema closings there in recent decades. 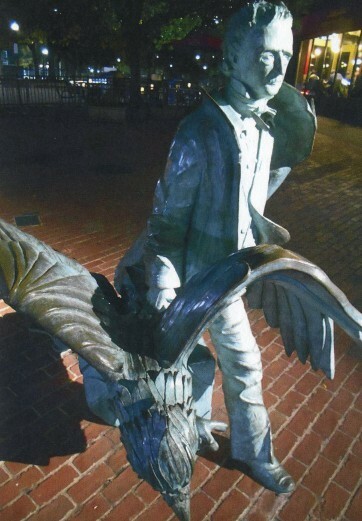 It also overlooks Poe’s hated Frog Pond in Boston’s famous public park across the street and is less than two blocks from the recently-installed Poe statue close to his birthplace. But I had a notion that the geographical connections went deeper than that (often to the point of being subterranean) and all-in-all made for an interesting night out at the pictures. But more on that later; I almost forgot about the film. 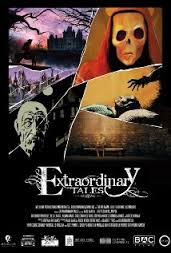 “Extraordinary Tales” was directed by Spanish filmmaker/animator Raul Garcia and produced under the auspices of Film Fund Luxembourg (don’t laugh: little Luxy is a hotbed of animation team-building, check out “Song of the Sea” or “A Town Called Panic” for starters). Each story is boiled down to its core element of terror and dread and narratively speaking the film is a little thin. I imagine that’s to be expected given 21st century attention spans as well the density of 19th century expository writing. (Exhibit A: the 60-word opening sentence of “The Fall of the House of Usher”). And it is “Usher” which kicks things off after we are introduced to the framing device. This has the spirit of Edgar in the form of the famous Raven ruminating over his literary legacy with various female-figure statues in a curiously beautiful pastel graveyard. The sharp-lined antique-y style of “Usher” suits the grim tale of a family’s doomed bloodline as that old self-imploding greathouse is practically the main character. Christopher Lee’s great portentous narration here turned out to be his last film part before his passing last June. The next narrator also sweeps in form the pale beyond as a scratchy period recording of Bela Lugosi reciting “The Tell-Tale Heart” is matched to stark B&W imagery in homage to Argentine comics artist Alberto Breccia. Ben-Day dots and colored overlays define the look of “The Facts in the Case of M. Valdemar” wherein an exercise in applied hypnotics goes way off the rails. The old warhorse “The Pit and the Pendulum” gets the quasi-realist look of an Xbox game and a Guillermo del Toro narration, the mechanics of the pendulum are especially well represented. 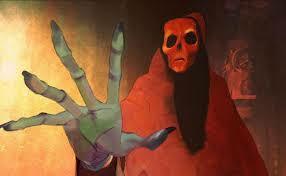 The concluding “Masque of the Red Death” may be the cream of the crop. The vibrant hues of its oil-on-canvas style (with visible brush strokes) are a feast for the eyes. The literal feasting—and dancing, card-playing and sexual byplay—of the royal partygoers, who cannot keep the Black Death at bay is portrayed without narration or (except for a couple of lines voiced by Roger Corman) dialogue. The slightly overexcited (universal) desire to partake of life’s rich pageant before death (Black or otherwise) comes a-calling was understandable enough without words. 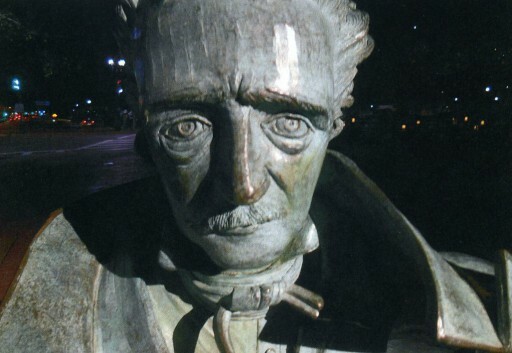 When these cinematic pleasantries concluded, I stepped out to a clear late October night and crossed into the Common, with Poe’s repeated motif of falling or being trapped underneath fresh in my mind. There’s the Usher mansion collapsing into an abyss, the prisoner imagining a drop into a bottomless pit before facing the pendulum and the master with the dodgy eyeball getting sectioned off below the floorboards in “Tell-Tale Heart.” As Tom Waits once had it “There’s a world going on underground.” Between the Poe plaque at the corner of Boylston St. and what was once the top of Poe-birthplace Carver St. (now a service alley named Poe Way) and the AMC Loews there are several places that would make great locales for this man’s stories. There’s the trench-like row of crypts in the Central Burying Ground (a one-stop shop for all you “Premature Burial” needs! 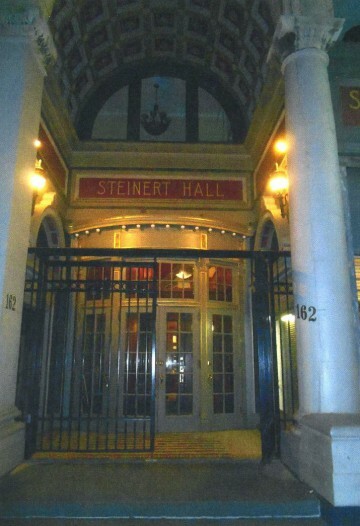 ), Steinert Hall, a recital auditorium four stories below the Steinway store (built by the piano-making clan in 1896 but closed to the public since 1942) and an urban-legend pedestrian tunnel from the tiny Boylston subway station possibly up to the Schubert theater two blocks away. It was Edgar Allan Poe’s literary successor H.P. Lovecraft that really put this macabre Ley-line notion into sharp relief. He once said that “there are black zones of shadow close to our daily paths.” While in real life this is not very comforting to acknowledge, in the aesthetic world it is super cool. In Lovecraft’s short story “Pickman’s Model,” the titular painter is banished from the upper-crust Boston Arts Club when his subject matter gets a little too hairy for the “Beacon St. tea-table” crowd. To wit: “There was a study called “Subway Accidents” in which a flock of the vile things were clambering up from some unknown catacomb through a crack in the floor of the Boylston subway and attacking a crowd of people on the platform.” (And you thought the T was bad nowadays). Those monsters, who may not be imaginary in the context of the tale, supposedly roam around in an extensive network of tunnels that fan out under central Boston from an opening in Pickman’s decrepit North End building, from where the artist muses, “these ancient places are dreaming gorgeously and overflowing with wonder and terror and escapes from the commonplace.” No kidding, right? The dreaming part of that statement certainly resonates with me. 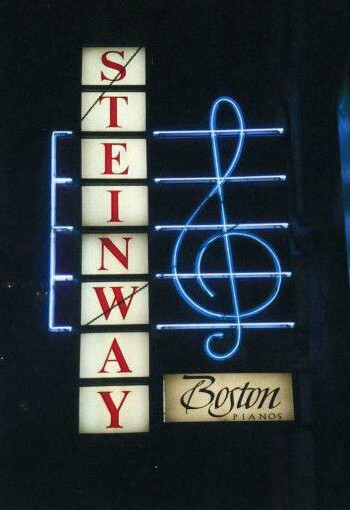 I can look at that block of Tremont St. and see the AMC Loews and a vestige of the façade of the wax museum that used to be next door and the great hulk of the Masonic Temple on the corner of Boylston (I’d love to get a look at their sub-basement!) but a shade behind it all is a reoccurring dream landscape that I have visited periodically for decades. This REM wonderland is a densely-packed district of curio shops, chop suey stalls, burlesque theaters, pinball parlors and Art Deco shopping arcades–an urban archetype of the collective unconscious. Maybe writing about will bring it back because I haven’t landed there in over a year. Walking back to my car, I passed by the Poe statue again, the morbid and magnificent author seemingly striding as quick as he can out of town (with his trusty Raven by his side) a cold shoulder turned to the dreaded “Frog-Pondians” of the city of his birth. In the “Extraordinary Tales” postscript he petitions for immortality in view of the six-foot hole. Mission Accomplished. Nowadays, our Subterranean Homesick Edgar is as iconic and indispensable in October as Charles Dickens is in December with “A Christmas Carol.” We can almost walk along beside him, dreaming gorgeously, one step ahead of the black zone at all times.